Luckily this integral of even a complex shape can be done easily by our CAD package, but we must make sure to specify that the point about which the moment of inertia is being calculated is the pivot of the pendulum. 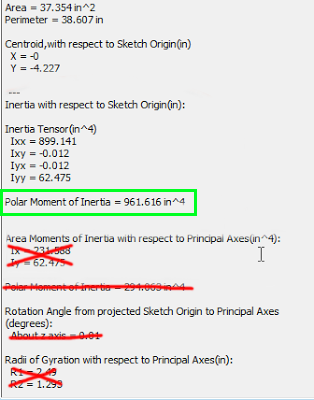 Make sure that the Sketch Origin in Inventor is at the pivot point of the pendulum. Use the data gathered in the previous point mass pendulum analysis. In the previous analysis, it is assumed that all of the mass of the pendulum is concentrated at the center of mass. However, a more accurate analysis can be performed that includes the effect of the rotational inertia (I) of the pendulum. The rotational inertia (I) of a body is the quantity that tells us how the mass of a rotating body is distributed about its axis of rotation. Similar to the center of mass analysis, the rotational inertia analysis can be broken up into two parts: The acrylic pendulum and the bolts. This procedure again requires values from Inventor. The start of the procedure has been copied for your convenience. Create a new sketch on the front face of the pendulum. 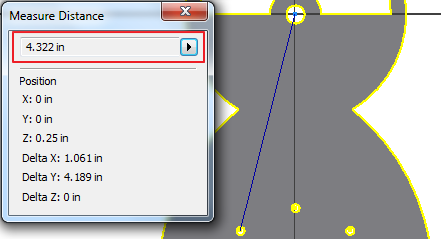 Click on the "Project Geometry" tool, and select the front face of the pendulum. Click Tools on the Ribbon, and then click the drop down arrow under "Measure." Click on "Region Properties." The Region Properties dialog box will pop up. Click on "Click to Add" in the top left of the box, and then click on the front face of the pendulum. Click on the "Calculate" button, and then mass properties about the pendulum will appear. The moment of inertia values are generated from the 2D profile of the sketch of the pendulum. To calculate the rotational inertia, use the equation below. Note: The units of the moments of inertia are given as in^4. To find the rotational inertia of the pendulum with bolts, the actual distance from each bolt to the pivot is needed. 4. Now, click on the "Tools" tab of the Ribbon. Select the "Distance" tool from the Measure box. Now, click the center of the pivot hole, followed by the center of a bolt hole. A blue line is drawn, and a distance box displays relevant information about the selection. The value displayed in the top box is the actual distance between the two selected points, and should be used for calculations in this section. Repeat this process for all bolts. Using the values obtained above, solve the frequency of the pendulum using rigid body mechanics.